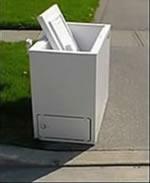 Place bulky items (furniture) out on your regular garbage collection day. One piece of furniture = one item. There is a six-item limit with each collection. The crew lift the couch into the rear packer. 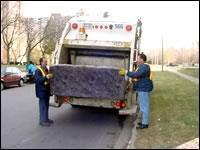 The truck compacts the couch, leaving room for more material. 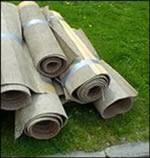 Roll, cut and tie carpeting into bundles and place them out on your regular garbage collection day. Bundles must be no longer than 1.2 metres (4 ft.), weigh not more than 20 kg (approximately 44 lbs.). Have more than 20 kg? (PDF). One bundle = one item. There is a six-item limit with each garbage collection. Special collection - metal “white goods"
Collection of “white goods” (refrigerators, washing machines, stoves, dishwashers, etc.) must be scheduled by calling Customer Service at 416-338-2010. 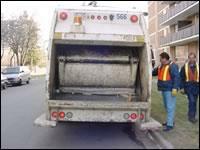 This material is collected by designated City vehicles.